Kaokoveld and the Himba People. – Crickey…….we're in Africa! 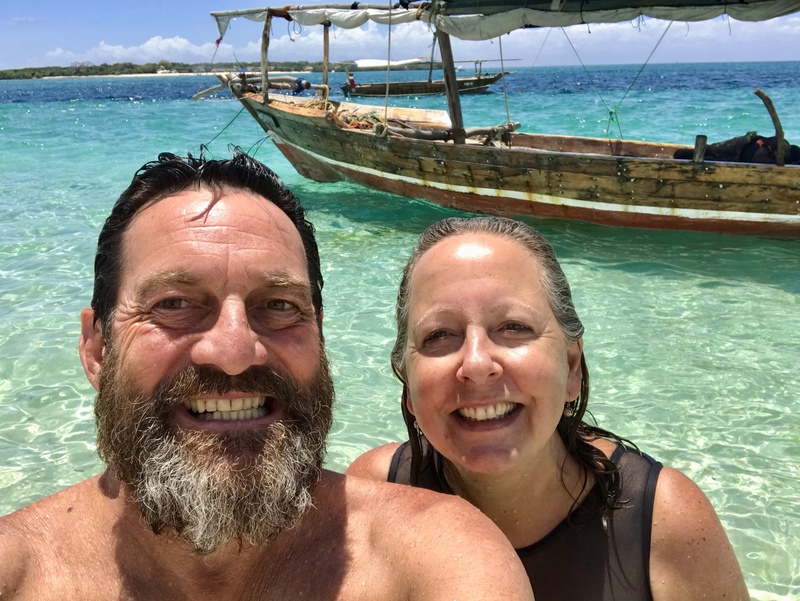 September 17, 2018 September 17, 2018 Marcus and Pauline8 Comments on Kaokoveld and the Himba People. Kaokoveld and the Himba People. We then continued north to Sesfontein which was the start of the Himba trail which winds around the Kaokoveld which is often described as one of the last true wildernesses in Southern Africa. We stayed in a community camp ground and after checking in we saw that the last campers they had were 11 days before! Early the next morning we set off on what would take us three days to cover around 400 kilometres so rough were the roads (tracks)! We were fortunate to see six desert elephant, many giraffe and zebra plus lots of different antelope. On our first day we came across four rented 4WD’s with roof top tents and filled with two German Geology lecturers and 14 students. One of the vehicles was being towed after it had a cooling system failure but they were all in high spirits and enjoying looking at all the rocks (bloody everywhere!). I even bought out one of my discoveries thinking they would tell me that I could sell it and pay for the trip however one of the lecturers told me that unless the trip would cost me $1 then I was out of luck! We saw one other German young couple who had never been off road before and you could see the fear in his eyes as he told me what was in front of us! That night we stopped at 4pm and wild camped just off the road and between then and 8am the next morning did not see a car go past. It was very windy and a bit cold but the stars were fairly blazing in the sky. Pauline and I climbed the hill behind the camp to take some photos and were nearly blown off the top! On our way again the next morning and all day we only saw a few vehicles and they were all local Himba people. We saw some incredible geological formations in the mountains and stopped and tried to communicate with some of the Himba people along the way which was fun. Some of the dry river crossings we did had super soft dry sand which made crossing them interesting and towing the Kimberley through sand is like having a sea anchor out the back. On one of these I managed to get only half way across before I was down to the axles in sand so firstly I let the tyre pressures down some more then dug the sand out from around the wheels while Pauline and Veronica found some wood to line the track with. I also put down all four of our sand tracks and then got in and was able to get through successfully that time. Veronica on the other hand gave her truck full throttle and was last seen jumping through the river bed with her back wheels coming off the ground by a metre at one stage but she made it through! We also had a mountain pass to get through that was very steep and was badly broken up with big holes and and rocks to manoeuvre around making things very interesting! It was low 4WD and and I would not like to do anything more difficult with the Kimberley on the back but I must say the Land Cruiser was doing it easy even with the trailer on the back. That night was another wild camp on the side of the road which we happened upon when I took a wrong turn but what I didn’t know was that it happened to be a link road between two villages so we had quite a few locals come past but with no problems. I have no idea who makes these out in the middle of no where but they are fantastic. Our second Wild Camp in Africa. Next morning we were up early and away at about 7.45am for the last leg into the town off Opuwo which is the unofficial capital off Himbaland and one of the most interesting and eye opening towns we have been to. Walk down the street and you will pass many Himba women in traditional dress and then right behind them will be a Herero woman in traditional dress. We stopped at the supermarket to pick up a few things and there too you are shopping right beside Himba and Herero women in their traditional dress. The Himba women don’t see themselves as being anything else but traditionally dressed and they have no embarrassment what so ever in fact some really like to pose and then have a look at themselves in the camera! Love to pose and then check her photo! We stayed in the campground of the Opuwo Country Hotel which was on top of a hill overlooking the town. The hotel boasts the largest thatch roofed building in Namibia and it houses the reception, restaurant, gift shop and a spa centre! We had been in a quandary as to whether to go further North to the Epupa Falls and Ruacana Falls because the dam upstream in Angola can cut the water flow right back for the power station requirements. So I jumped on the Facebook “Overlanding Africa” page to ask the question and found out that there was a good flow at the moment. So off we went to the sleepy village of Epupa to see the falls and they didn’t let us down. The falls are quite wide and has many smaller falls but the main one was quite impressive. We stayed at a campground and our camp site was right on the banks of the river and only 50 metres from the falls. Can you spot our Karavan? Children having a great time in one of the rock pools beside the falls. A visitor in our camp site at Epupa Falls. That night Veronica made pizzas for dinner cooked in the Weber Baby Q which was another Weber piece of brilliance! We also decided to take a guided walk to see some Nile Crocodile with our local guide John but it ended up we took him in our Landcruiser. We drove along the Kunene River which is the border between Namibia and Angola, stopping every now and again to walk along the river looking for crocodile and we managed to spot three of them. On the way back we came upon three girls around 12 years old and they were on there way to town to buy some supplies for their primary school which was a 16 kilometre walk both ways. So we gave them a lift into town and would have saved them a 9 kilometre walk that day. It is extraordinary what distances these children can cover just going to and from school with some we talked to walking 9 kilometres each way. We then turned west and followed the Kunene River along to a campground that had been recommended to us by someone we met at Epupa Falls called the Kenune River Lodge and camp ground. On the way we went through a lot of Himba farming land along the banks of the river where they grew vegetables and fruit and also lots of goats and cattle. It was much more populated than we were used to and all the children would run out to the road to wave and also in the hope someone would stop and give them a treat. We have been giving them fruit and sweet rusks which they all loved and would always say thank you. They would also like to have their photo taken and then view it themselves letting out a squeal of delight when they saw themselves in it. Then the next day it was on to the Ruacana Falls although it should be renamed the Ruacana Rock Face due to the hydro power station not letting any water over the falls. We continued on and along the way we had a water canal running alongside the road which was being used by all the locals to wash their cloths, themselves and to irrigate their crops of tomatoes, onions and cabbages. We stopped at one of the road side stalls and bought some beautiful tomatoes and onions and then had tomato and onion sandwiches for lunch! Next stop Etosha National Park. Great photos as usual guys. Lots to see & experience. Thanks you two. It has been amazing so far. Did you go out through Puros? Very few people do but it is definitely worth while. Truly amazing guys! Such beautiful smiles on the locals too. Previous The Skeleton Coast and Petrified Forest. Next The Etosha National Park in Namibia.